On February 18th, the International School Dhaka's Bangla Club arranged the first ever Bangla Language Competition for English medium with participants from eight schools taking part in the competition. Other than ISD, the schools taking part were Sir John Wilson School, DPS STS School, Play Pen, Scholastic, Manarat International School, The Aga Khan School and Sunbeams. The day started off early with participants from each school registering for the competition. This was followed by an Extempore Speech session. The respective participants were given a ten minute preparation time to prepare a five minute speech. Topics ranged from Bangla language and literature to culture and general knowledge about Bangladesh. This session was followed by a cultural show presented by the students of the participating schools sans ISD, who arranged a cultural show later on in the day. The extempore speeches were followed by poetry recitation and creative writing. After a break for the Jummah prayers the competition reconvened for a spelling bee competition aptly named Spellathon. The highlight of the day however was the quiz session where the contestant school students were shown pictures and were asked questions related to them. The objects of the photographs ranged from pictures of famous Bangla language poets to flowers to national monuments. At end of the quiz session it was said by the MC Ferdous Bappi that this competition was not intended to judge which school teaches better Bangla or which school's students have a more in depth knowledge of the language. The whole point of the competition was more to encourage and engender interest in our mother tongue. The quiz session was followed by a speech by Anisul Hague who shared stories and his personal views about the promotion of Bangla in our country while reiterating the view that this competition was about inspiring students to take an active interest in Bangla. As an added bonus a concert featuring Arnob was also arranged. The organisers started working to realise this event four months ago and have worked diligently to bring this competition to fruition. The competition was an initiative of The ISD Bangla Club, primarily an undertaking of one Namit Kabir, a grade 11 student of ISD, who took on this responsibility to promote our mother tongue while at the same time fulfilling her Creativity Action Service project requirements. She was helped by Ms. Farjahan Rahman and Ms. Tahsina Rahman, the secondary school Bangla teachers at ISD. The team who also endeavoured to bring about this competition were Mashrur Reza, Tahsin Islam, Antara Rabbani, Raeesa Rahemin, Shadman Rahman, Zahidul Sajid and Zuhayr Reaz, all students of grade 11 at ISD. With the anticipation of the Cricket World Cup hanging in the air, cricket is now (almost) the most talked about sport among members of the youth. Cricket tournaments, from garage “short pitch”, to domestic leagues to international ones, all seem to be springing out of nowhere. With the hope of initiating goodwill and to an extent, generate more buzz for the upcoming World Cup, the City Montessori School from Lucknow, India, organised an interschool Twenty 20 cricket tournament, with teams being invited from schools in Bangladesh, Nepal, Sri Lanka, and India. Starting on the January 25, the four day tournament was kicked off with an opening ceremony based around the theme of raising religious tolerance and spreading the message of peace. With Chief guest, BCCI vice president Rajiv Shukla presiding over the press conference, along with speeches from Founder Manager of CMS Jagdish Gandhi and Principal Vineeta Kamran, the tournament commenced with the 18 teams being drawn into 6 groups. Matches were played at two stadiums of CMS under floodlights, with live screen showing replays, commentary, and with a spectator attendance of 2000 average at every match. The matches were fed live to the local Lucknow TV channels. The Aga Khan School represented Bangladesh in the tournament. AKS faced Gateway Int'l School from Sri Lanka and Chinmaya Vidyalaya from New Delhi. AKS lost first match to Gateway Int'l School, and won against Chinmaya Vidyalaya by 39 runs. AKS scored 162/7 and Chinmaya scored 123/8 in the allocated 20 overs. Man of the match was Afeef Ahmad Hafeez who took 3 wickets for 10 runs in 4 overs and also scoring 55runs while batting. Opening batsmen were Syed Abrar Hossian and Rayed Bin Wahed. Captained by Mohaimenul Hossain Onik, and coached by Mr. Dulal Gomes, the team from AKS received the Most Enthusiastic Award for the fair play and elegance they showed throughout the tournament. The closing ceremony was held with the guest of honour, Indian star cricketer Suresh Raina. He handed out the prizes to the awardees, with the Champion being Nalanda College and runners up being Ananda College, both from Sri Lanka. The event was wrapped up with the formation of the International Council for School Cricket (ICSC). The participating players' names will go down in the history books as the founding members. AKS received the honour of being the Regional Delegate for Bangladesh. AKS will nominate five of the future teams that will represent Bangladesh in the ISCPL, which will be now held every alternate year. Engineers are thought to be in possession of a mechanical and calculative mind for their numerous efforts in realising scientific vision. But it was Pythagoras who tried and succeeded in representing the musical notes and tones in numbers. The outstanding talents of the students of Bangladesh University of Engineering and Technology proved with distinction that they are not too far behind in art and culture on the 13th February, the first day of spring, with some ingenious performances in front of the cafeteria in the BUET campus. There was a sudden profusion of colour all around. The person next to you on the public transport sneezes revealing his allergic reaction to the abundant pollen in the air. Spring is all around you. And the first day of the Bangla month of Falgun is upon us, right before the Valentine's Day on the 14th, providing our very own deshi Valentine. But this is not the point. The celebration of the first day of spring matters. 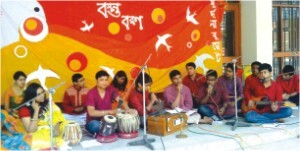 Keeping up with the tradition of organising festivals in the university area, a group called Murchchona, comprising mainly of BUET students, arranged the Bosonto Boron Utsab on the university campus to welcome the new spring.